Wall art in 10 minutes with no holes in the wall! Wall art in 10 minutes with no holes in the wall! I’ve been dreaming of an inspirational work space for so long and it is weird to say that one wall is finally complete now that I’ve added some fun prints! Wall art can be a really funny thing because it is so personal. In the past I’ve played it safe and used photos of my family and friends but realize that switching it up and adding a few prints mixed in that speak to me is the way to go. If you follow me on Instagram, you know that I’m at the beach or enjoying the sunny SoCal weather as much as possible. So when one of my fave little print shops, Jetty Home, started their very own website I knew I had to grab some prints for this wall to mix in with some beach photos of my own. And as a celebration Jetty Home is offering you 15% off coupon code that you can snag by signing up right here. 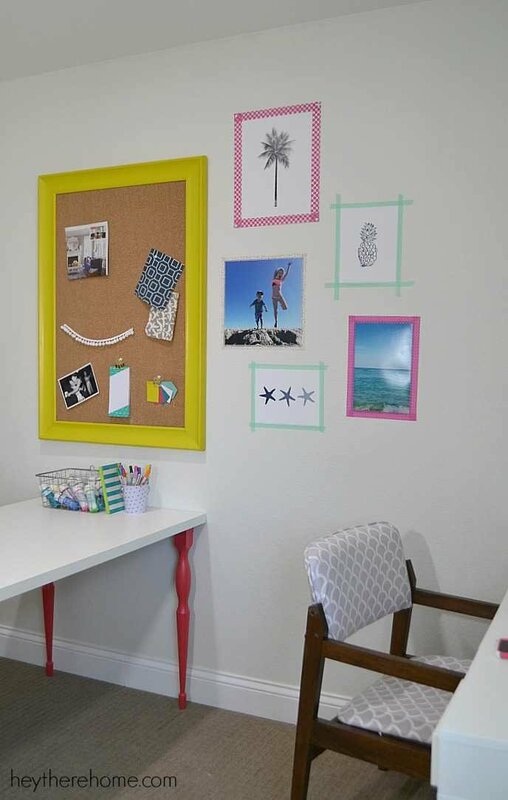 I already had a big dose of color with the chunky frame on my DIY corkboard so to add another shot of color without overdoing it and make a super easily changeable inspiration wall, I used washi tape to frame the prints I got from Jetty Home and a couple of my favorite beach photos. You may remember when I used their prints in my kid’s bathroom renovation. 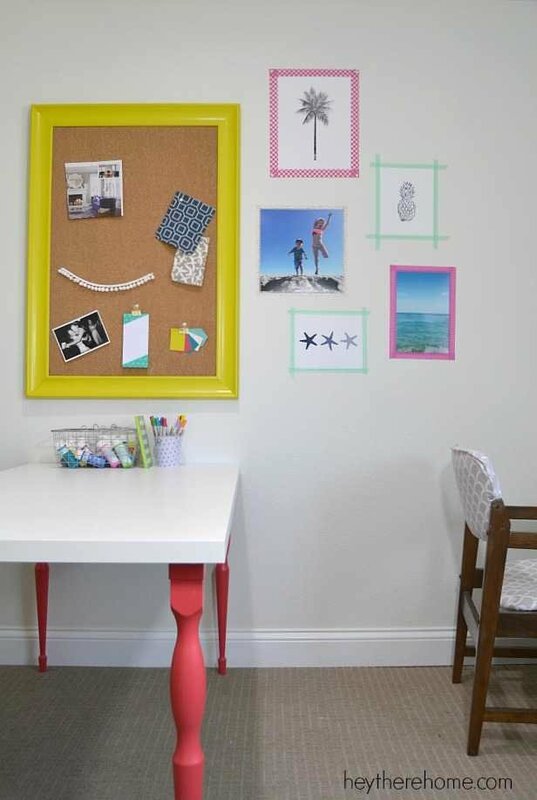 If you want to put up art and change it out often or you rent and don’t want to poke holes in the wall this is an awesome solution and it takes less than ten minutes. 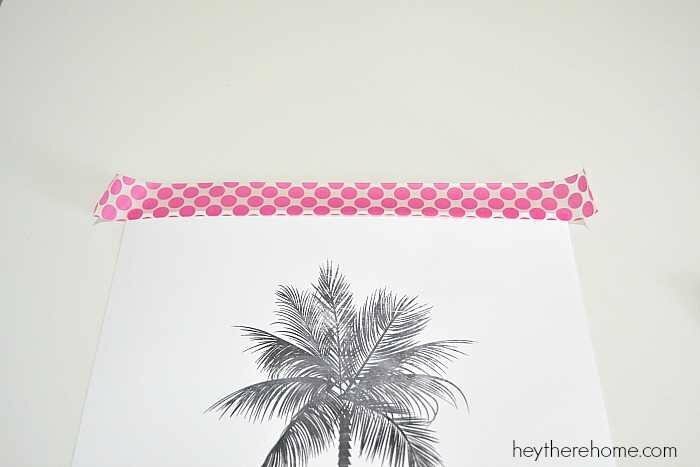 Step 1: Grab your prints and some rolls of washi tape. 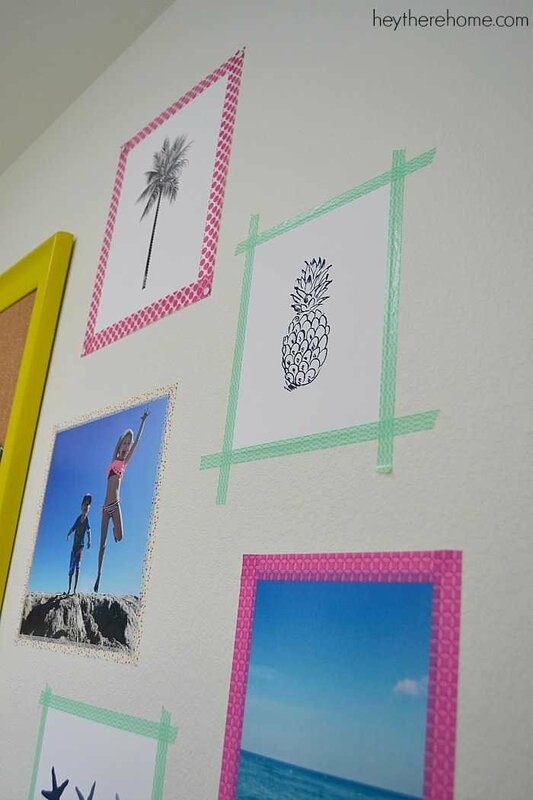 For those of you that are new to washi tape it is a paper like tape that doesn’t leave any residue on the wall and comes in a ton of colors and patterns. You can find it at craft stores, in Target in the craft/stationary section, or even on Amazon. 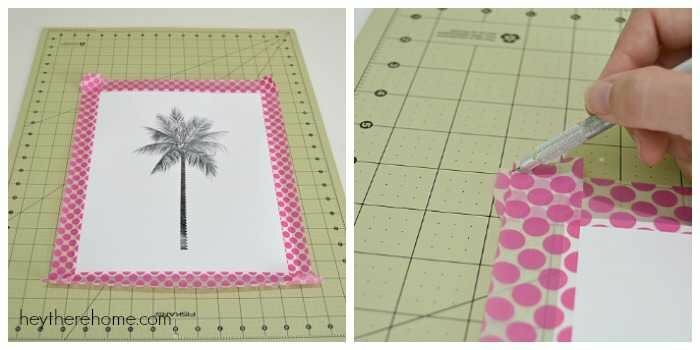 Step 2: Create a border on all sides of your print or photo placing half of the tape on the paper and half off of the paper. Step 3: For clean corners, cut the edges straight using an xacto knife. Step 4: Hang them up! Tip: Some tapes stick better than others. 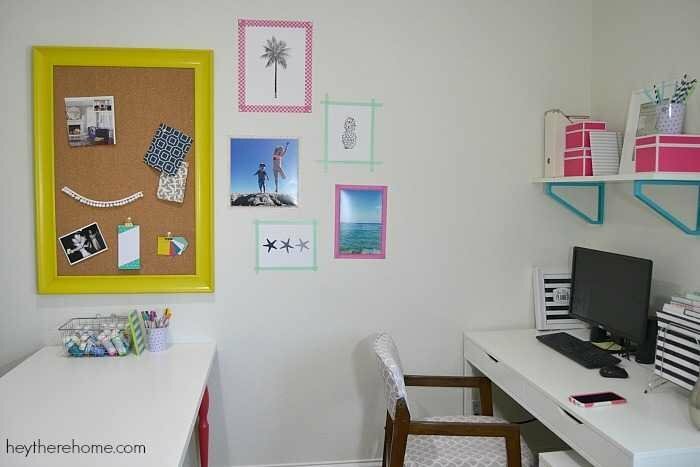 If you find one peels off of the wall (which is more likely to happen if you have glossy walls) use a thumb tack just in the corners to keep it sticking to the wall. I’m loving the way this room is coming together! It has been a process because it started out with so much stuff and paperwork to sort through but I almost have it under control and have my eye on the prize! Jetty Home is offering 15% to my readers! There are lots of prints that you can have them print and send to you or download and print yourself as well as some super cute home decor! You can get the coupon code by singing up right here, or visit the JettyHome.com website. 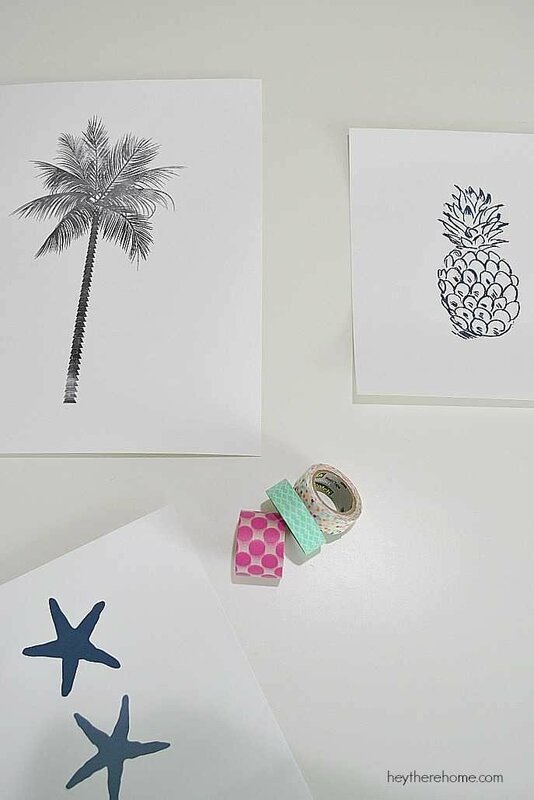 A big congratulations to Emily at Jetty Home for launching her website and making her awesome prints available for all of us, and of course a thank you for sponsoring this post!